Pollution, sun, dust and grime play havoc on your skin; so even sensitive and delicate skin needs to be scrubbed clean as often as once a week. Mere cleansing is not enough, you shouldn’t skip this beauty routine of scrubbing just because your skin is sensitive; go in for a mild facial scrub that suits your skin instead. 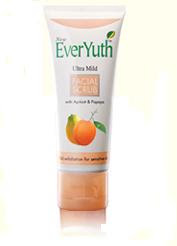 Everyuth ultra-mild facial scrub with micro granules is one such mild-scrub; do give it a try. As mentioned on the pack, this specially formulated Apricot and Papaya scrub’s mild exfoliating action deep cleanses pores from within and gently removes dead skin cells, blackheads and whiteheads – making skin feel fresh, healthy and smooth. While apricot moisturises skin making it soft and supple, papaya smoothens skin texture and removes dead skin cells. Thanks a lot for writing this review. It's so hard for me to find these info.